This week I’m auditing a clinic with my friend who is in the Ecole de Légèreté Teacher’s Course and yesterday an interesting topic came up – how to pick up your reins. 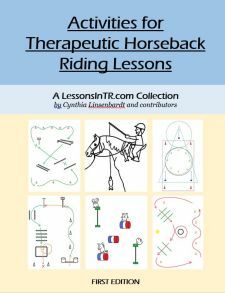 It’s something I was never specifically taught how to do, other than “softly, without bothering your horse,” and that every professional at the clinic seemed to do differently, so I wanted to share how we were taught to pick up the reins by the clinician. With one hand, hold the rein at the buckle on the neck, folded at the buckle joint so there is a tiny loop sticking up. With the other hand, take the loop and pull it up, leaving your first hand low with the fingers in a circle around both reins, letting the reins slide through them as the other hand brings the buckle end up, until the desired contact is achieved. It’s a motion like a pulley or threading a string through a hole. Don’t lean forward or change your body. The hand bringing the rein up can move in front of you to keep your check open, instead of toward you where there’s no room and your chest may collapse. Once the reins are shortened like this, drop the extra to one side and transfer the correct rein to the empty hand. 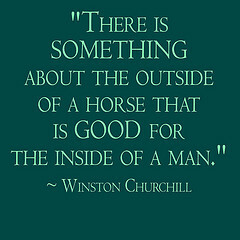 For a description with pictures to illustrate, see this article on Horse&Rider. For therapeutic riding, you may need to modify based on the rider’s abilities, such as having the sidewalkers help hold the rein up for the rider to reach, or having the rider pick up one rein at a time as they work on fine motor skills. The article above does mention that when the rider spreads their hands to pick up and shorten the reins, it usually causes them to lean forward, which should be avoided. Overall I think the most important thing in our profession is to make sure the reins are always picked up softly so we do not bother our horses or cause bad habits, so if sidewalkers are helping, make sure that they are aware of this. For new riders or ones with difficulty reaching and grasping the reins, I often hold the reins up by the buckle when prompting them to take hold of the reins, so that when they do the reins are automatically running through their hands the correct direction, as often the concept of which direction the reins run through the hands is confusing. This also helps direct their attention to the reins, and teach them visually what the reins are. I think this would translate nicely to the way of picking up the reins we just learned, once the rider is ready to progress. How do you teach your riders to pick up their reins? How to you modify? How do you do this while keeping your horses happy?